6.3 Update Pokemon Go++ 1.45 how to hack? 7.0.1 What if you didn’t allow location access? I have tested it on my iPhone 6 running iOS 10 beta 2 as well as iPhone 6S running iOS 9.3.2. Just in case if the app doesn’t install on your iPhone, give it a hard reset by pressing down Home and Power button until it reboots. Open up safari and go to this link on your iPhone. If you already have Pokemon go installed, delete it. 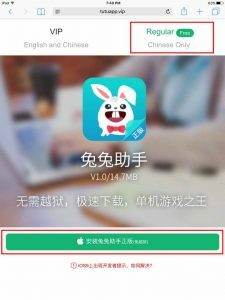 You will see a webpage with the green button which says something in Chinese. Press the green button and a popup will come. Hit install on that. Now wait for the app to install, once its installed. Go to Settings > General > Profile & Device management and allow the new profile. Go back to home screen and open up tutu app. 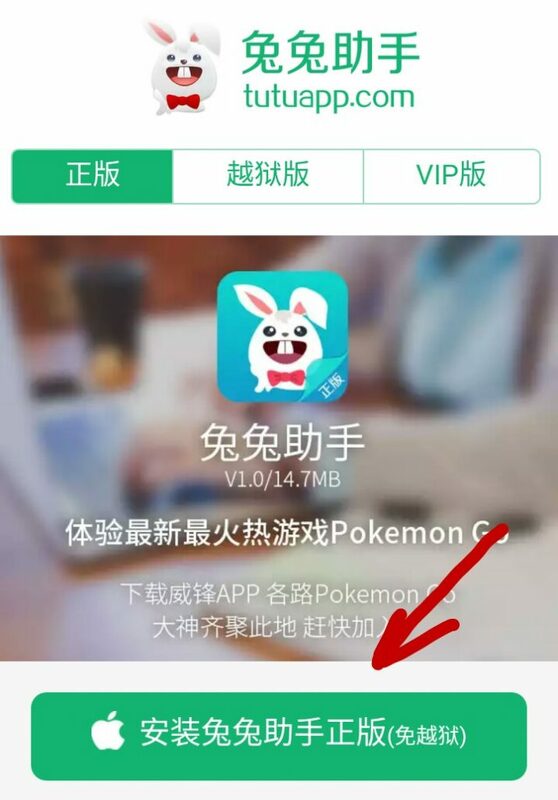 Inside this app you will find 2 versions of Pokemon go, you will need to install the hacked version. Just look at the screenshots of the app and you will be able to differentiate between two. Once installed, Go back to Settings, General, profiles and trust the new profile. Update: Many people were complaining that they are unable to download the app anymore. A lot of people were also saying that they are unable to catch any Pokemon using this hacked game. I have found a couple of other methods to install this hacked version of Pokemon go. Tap the install button there and you will be redirected to Settings app. There you will have to install the profile. Just install the profile as it is verified developer profile. Now go back to HomeScreen and wait for the iOSEmus app to install. Once installed Open it. One thing to keep in mind is that the iOSEmus app is not a very fast app so please be patient. Open Safari web browser on your iPhone and open this link. Once installed, you will need to go to Settings > General > Profiles. There you will need to trust the profile and then you can play the game. Now you can open Pokemon go and login with your account. If you notice, you will have 3 buttons overlaying which allow you to run and move around without having to go outside. In Pokemon Go, you have to walk around and find the Pokemon that is not shown unless you physically walk near them, or spoof your location to trick the game that you are there. Just in case if you wanted to know all the Pokemon, PokeStops, and Gyms that are near you, there are some ways you can accomplish that by installing an app called GoGo Maps on your iPhone or iPad. This app shows you all the Pokemon, Pokestops, and Gyms that are near you and then you can simply go there in the actual game and catch them easily. GoGo Maps is not officially available Globally that means you have to manually install it from 3rd part source. Below is the link to Hipstore page for GoGo maps. Just install from the link given below if it is not available in your app store. There is another alternative to the GoGo Maps app which does the exact same thing in a browser window. Just open this link inside the Safari browser and tap on the GPS button and it will show you all the Pokemon that are hidden inside the game. Okay so you might be thinking, why am I adding this thing here? Isn’t this post ask about Pokemon Go Hacks without Jailbreak? Well basically if you play Pokemon Go in landscape mode on your iPhone, you will actually enjoy it more and it is even easier to catch Pokemon. Just to let you guys know that this is obviously a bug and it will get patched in the future. First of all, make sure that you have the orientation lock turned off. So go ahead and unlock orientation if it is locked. Now rotate your iPhone in Landscape mode and open Pokemon Go. For this truck to work, you will need to keep your iPhone in landscape mode or it won’t work. Now you will see that Pokemon Go is running in Portrait mode, that’s fine. Now you have to open settings of Pokemon Go. If you don’t know how just tap on the Pokeball and then hit settings option. Now tap on “Report High-priority issue”. This will open Safari and you will notice that Safari is in Landscape mode. That is because you had your phone in landscape mode all the time. Now just hit the home button and Again open Pokemon Go. This time, you will notice that Pokemon go is in landscape mode. How this helps in catching Pokemon? Well if you tap on a Pokemon in the map, you will notice that the Pokemon comes right under the Pokeball. Which means you can literally drop the ball on top of Pokemon and it will hit that puppy easily. Some of the methods mentioned above are causing problems for some users. They are unable to catch Pokemon and they are also not able to train their Pokemon in gyms. Good news is that jailbreak is out and I would Highly recommend you to jailbreak your iPhone before Apple plays the villain and stops signing iOS 9.3.3. For those of you guys who are hesitating to jailbreak, here is a list of reasons why you should jailbreak your iPhone. For those of you guys who jailbreak their iPhone, here is the best Pokemon Go Hack that will make your life so much easier. You can see which Pokemon are near you and then just tap on that Pokemon and you will automatically walk to that Pokemon. You can increase your Pokeball accuracy. Which means that you can be pretty mush certain that you will catch them in first tries. You can see the map of your current location in Pokemon go and see all the Pokemon that are in that area. If you don’t want to jailbreak then that is also cool. You can wait for some days and this tweak will be available as a sideload and I will update this post once it is available as sideload. Open up Cydia and head over to the sources section. Once done, go ahead and open the Cydia source that we just added and then go inside All Packages folder. It is a free tweak so go ahead and install it on your iPhone. Once installed you will need to downgrade it. That’s because for some reason the Poke Map feature doesn’t work in the latest version. Just press the modify button and select Downgrade. There you will need to select 1.3r-80 version. Once done, you guys can start enjoying, what I like to call, the Ultimate Hack for Pokemon Go on iPhone. As I promised you guys that when there will be a sideload available for your latest hacked version of Pokemon go on iPhone, I will update you guys. Here is the tutorial that you can use to install hacked version of Pokemon Go without jailbreak. Before I start to show you what to do, just wanna let you know that you will need a computer for this back to work properly. But, that shouldn’t be a deal breaker because this will Work on Windows as well as Mac. And you are able to hack version 1.1.0 of Pokemon Go. This ultimate Pokemon hack will allow you to perform a lot of tweaks and actions that I have mentioned below. You can have a joystick in Pokemon Go which will allow you to walk around with actually have to walk. This hack also includes Enhanced Throw. which allows you to throw the pokeballs at Pokemon and it will be a lot easier to catch them. You can change your walking speed using this hack which will basically help you hatch the eggs a lot easily. You can have a map of your area with all the Pokemon and pokestops listed there. The best part about this is that you can drop the pin on them and walk to that location very easily. Patrol mode will keep you character walking and it will basically hatch the eggs on their own. You can also see all the Pokemon that are hidden near you. Just tap on them and boom, you will go near them and find them. First of all, you will need to go to this link which will take you to Cydia Impactor page. Don’t worry, we are not jailbreaking, it’s just a tool that allows you to sideload apps a lot easily. Once you have Cydia impactor, go to this, this or this link and download the hacked IPA file of Pokemon go in your Computer. Next, you have to make sure that you have iTunes Installed on your system. It just needs to be installed, not running, just installed. Delete the Pokemon Go game from your iPhone if you have it. We are going to install hacked version. Connect your iPhone to your computer and open Cydia Impactor. Make sure that Cydia Impactor has detected your iPhone. Now Drag and drop the IPA file in Cydia Impactor. It will ask you to put in Apple ID. You can use any Apple ID, but it needs to be valid. You will also need to enter the password. Now Cydia Impactor will take a couple of moments and sign the hacked Pokemon Go IPA with your Apple ID and install it on your iPhone. Go to Settings > General > Profile & Device management and trust the developer profile of your apple id. Now you can launch Pokemon Go from the home screen and boom, you have a hacked version of Pokemon Go v1.1.0 working on your iPhone. Just Don’t use the teleport feature and go back home before closing the game, this way you will not get banned. Niantic is banning hack players permanently. Read tips to prevent permanent ban in Pokemon Go. Apparently, there are a lot of people getting into this trouble. Basically, you guys are leaving footprints of the hack, and Niantic is able to soft ban you. And then you are unable to catch any Pokemon or Gym. So why is it happening and how to avoid getting banned? First of all, don’t hack your location in Pokemon go that much that it becomes obvious that you are hacking. In other words, if you are hacking the location and move from 1 town to another within minutes, then anyone can tell that you are hacking the game. Just move around your actual location and keep it realistic. Don’t close Pokemon Go while the location is hacked. Suppose If you are in a totally different location in the game and then all of a sudden you press the home button and close the game as is. All good until now you again open the game after 10 minutes and you are in your home. This is obvious footprint that you are hacking the location because no human can walk 100 miles in 10 minutes. Simply use the joystick to walk back to your home and then you can close the game. If you have “Walk back to home” button then you should use that and once you are back home, close the game. Hopefully, now you guys wouldn’t get banned while using Pokemon go hack. 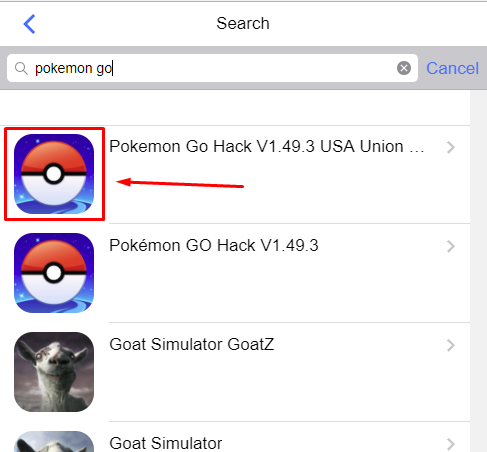 So finally after so much wait, there are some links that are available for you guys which will allow you to download and install Pokemon Go hack on your iOS 9-9.3.4 and iOS 10 devices. This hack will work on iPhone, iPod touch as well as iPads. If you don’t know, then I will tell you that this is from tutuapp which is a very famous app for Pokemon go hack on iOS and Android as well. First of all, I want you to go to this link in safari browser on your iOS Device. Here you will have to tap on the Install button in the top right corner. Now the web page will ask you to choose from 1st or 2nd link. I want you to choose 1st here. It will then show you a pop-up with some Chinese text in it. Just tap on install. Once done, go back to Home page and Open tutuapp. Swipe to the left for a couple of times and you will be inside the actual app. Here if you notice, you wouldn’t find Pokemon Go because it is hidden. Go ahead and press the green download button and install it on to your iDevice. Just wait for the app to get installed and you will see that the icon will change to Pokemon Go. Go in Settings > General > Profile & Device management and here you will need to trust the new developer profile. Now you can go back to homescreen and start playing hacked version of Pokemon Go. Just keep in mind that you have to allow the Location access, otherwise the app wouldn’t work. Open this link in Safari and there you have to choose Install button in the top right corner. The page will ask you to choose from 1st or 2nd. I want you to choose 2nd this time. Now it will ask you to allow the install. There will be Pokemon Go installation popup. Just tap on install. Once the app gets installed, it will start showing up as Pokemon Go. Now go to Settings > General > Profile & Device management and here you will need to trust the new developer. Now you can go back to home screen and open Pokemon GO hacked app. Make sure that you allow the location access otherwise, the hack wouldn’t work. In this method, I am giving you the official tutuapp link, just in case if the other links stop working, you will have another link to get your hands on Pokemon go hack. The process is exactly identical to the method #1 but this time, you don’t have to choose any 1st or 2nd server. Just open this link in safari and here you have to select the middle link from the top bar. I have posted an image to highlight the link. Now hit the green download button and it will ask for your permission. Tap the install option and go back to home screen, it will get installed shortly. From here the process is identical. 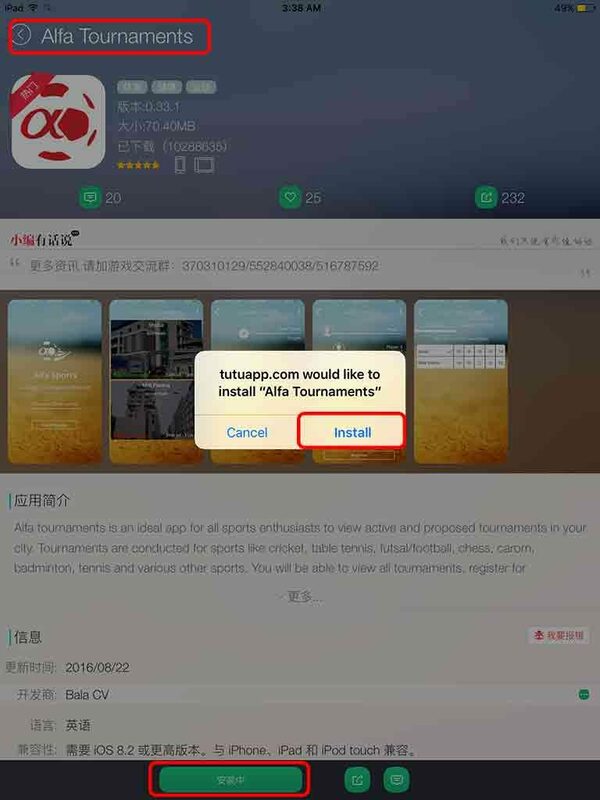 Just trust the developer from the settings, install Alpha tournament app from tutuapp. Once installed, it will become Pokemon go hack, go in settings and trust the developer. Boom you have now installed Pokemon go hack. Okay guys, So the latest Pokemon Go version 1.7.0 with buddy system is out and as promised, here is the hack for Pokemon go 1.7.0. No computer and No Jailbreak is needed. So without any delay, let’s get started. You will only need 1 link and that is given below. This hack works on iOS 9 and iOS 10 without jailbreak. Open this link in Safari browser and you will be redirected to a web page. Here you have to tap on the “Regular (Free)” button on the top right. Now Tap on the Green button. As I have highlighted below. You will see a pop-up asking if you wanna install it or not. Tap on the Install and wait for the tutuapp to install and show up on your homescreen. Now open tutuapp from the home screen and tap on the “Pokemon Go” icon from. I have attached the screenshot below for reference. There you have to tap on the green install button and it will ask if you wanna install it, hit Install. The great thing about this app is that you can have the hacked and non-hacked Pokemon go installed at the same time. Enjoy! Apparently, all the methods mentioned above have stopped working because Apple has revoked the developer certificates and now I am trying to find a working Pokemon go hack for iOS 9 and 10 without jailbreak. Until then keep visiting revkid.com for future updates and let me know if you guys are interested in a small giveaway. As of 26th September, the tutuapp has been re-signed with a new certificate and now you can install and trust it without any problem. 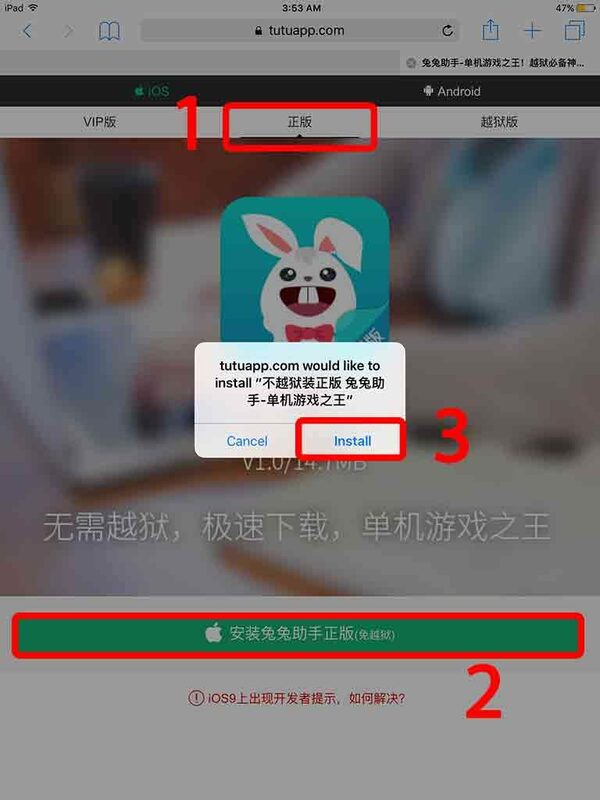 If you already have tutuapp installed and you are not able to verify it, remove tutuapp and install it again from the link given above. It should get installed and trusted. Okay, so today Niantic choose to change their server’s API. Which means that all the Pokemon hunting sites and map have stopped working. API is the way developers make their apps and tools talk with Niantic servers. With the new API they will take some time updating those tools but hopefully they will come back up soon. I will keep you guys updated and if you guys got some update first, do let me know. I just stumbled across a link where the Latest hacked version of Pokemon Go is available with a crash fix. Kudo to the developer of this hacked Pokemon go. It does work on iOS 10 as well as iOS 9 and you simply need to follow the steps given below. Open this link in Safari and there you will see 2 links. Now all you gotta do is follow is instructions as mentioned there. First install the crash fix by clicking the button and once it’s installed completely, install Pokemon go hacked version. After that is installed, you know the drill. Go to Settings > General > profile device management and trust the developer. Congrats now you have hacked version of Pokemon Go installed on your iPhone 7. Or iOS 9/10. Okay, here is the good news we all have been waiting for. The latest pokemon go no computer hack is out and available for you to download and enjoy. Just like in the older versions, we know that its the tutuapp where you are able to install the pokemon go hack and this time is no exception. But there is a little trick to get the latest version of pokemon go hack and I am going to show you that. Open this link in Safari on your iOS 9 or 10 device and it will ask you to install older version of Tutuapp helper. That is necessary because the English version of tutuapp is not providing the latest version of Pokemon go hack. Simply tap on install when it asks. Wait for the app to get installed. Once installed, Open Settings > General > Profiles & device management and trust the untrusted developer. Now open the tutuapp and there you will find the latest version of Pokemon Go hack. Simply install it by pressing the green download button. Once that is finished installing, go back to Settings > General > Profiles section and trust the developer certificate associated with Pokemon Go. Next you can simply open the Pokemon go hack and start playing it with all the hacks that we all love. One cool thing about this hack is that you can install the official app from the app store and the hacked app from tutuapp at the same time. I will not recommend you to use your main pokemon go account in the hacked version because it can cause a ban. On October 27, 2016 Niantic released latest version of pokemon go and all the users are facing the error message of update. The problem is that if you are using the hacked version, you will lose that hack if you update. Well, below is a working fail-safe method of installing pokemon go version 1.13.4 hack. No Computer No Jailbreak needed. Open tutuapp.vip in safari browser. Tap on the regular link and dowbload tutuapp helper from the green button. Next you will need to trust it’s developer certificate from Settings > General > Profiles. Now open the tutuapp and there you will see the updated version of pokemon go hack. Thanks to OmarXCydia, we can now install latest version of hacked pokemon go without jailbreak and without computer. Just follow the steps given below. Open this link in safari. Tap on the install crash fix button and once it is installed, tap on the install button for Pokemon Go hack. Once installed successfully, go to Settings > General > Profiles and here you will need to trust the developer certificate for pokemon go hack. On November 20th, Niantic released 1.17 version of Pokemon Go and just like before, it broke the hack. Luckily tutuapp is back and working again. This is just update, letting you guys know that you can get pokemon go v1.17 from tutuapp.vip and enjoy the hack. Next you will need to delete any Pokemon Go version you have installed on your iPhone prevously. After a lot of wait, there is finally an updated way you can get Hacked version of Pokemon Go on your iPhone without PC. Cool thing about this method is that it also works on iOS 11. Delete the original Pokemon Go app from your iPhone. Open this link in Safari and click the “Install AppValey” button. Allow the installation by clicking “Install” on the pop-up and go back to the home screen. Wait for the app to get installed, the App icon might not look right and the developer is aware of it. After the installation is finished, open Settings > General > Profiles and here you will need to trust the developer certificate of App Valley. Last step is to open App Valley and go to Library > Games > Pokemon Go++ and install it. There is a new Cydia alternative that allows you to install basically any modified app that you want without jailbreak. Its called Cyrus and you can also install Pokemon go hacked version from this app. Open cyrus installer website in Safari and scroll down. Press the “Install Cyrus” button and it will take you to the settings of your iPhone. Here you will need to install a profile that will allow you to use Cyrus on your iPhone. Simply press the install button and it should be installed and you will be redirected back to the Safari tab. Press the home button and look for Cyrus icon on the home screen. Open it up and here you can see all the apps you can install. You can find Pokemon Go++ from the Tweaked apps section. Once you have installed it on your iPhone, you will need to trust the developer profile from Settings > General > Profiles to run the game. Around the end of July 2017, apparently all of working pokemon go hacks stopped working and a lot of you guys started commenting about the same. This is an update to that matter. I have a great news for you guys. Now there is a new tool available that can help you avoid Apple’s certificate revokes. This means now you can have Cydia apps without jailbreak, hacked Games and paid appsfor free without jailbreak for life. Even cydia impactor app will not get revoked. Before you guys start accusing me of stealing, crall edit for this awesome tool goes to the developer. I am just sharing his work here. 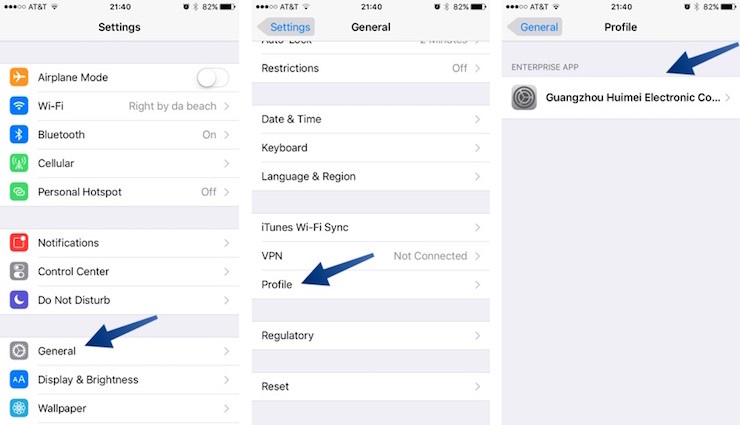 The tool is called antirevoke and it works by instaling a vpn profile on your iPhone. You are not supposed to to connect the vpn, that is why the internet speedof your iPhone doesn’t get affected. Best part of this tool is it also works on iOS 9, 10 and 11. First of all you will need to clear your iPhone browser cache. Open settings and navigate to safari. Here you will need to press the “Clear Browser history” button. Now, Simply visit this link on your iPhone Safari browser and press the “Install Profile” button. If you get redirected to an ad, kill the redirect and go back to the page again. As soon as you will press the install profile button, you will be redirected to settings where you will be asked for permission to perform the installation. Just follow the on screen instructions. If you are asked to enter a pin code or password, this will be your lockscreen password. Now you are all set, install any of unofficial apps and it won’t get revoked. Enjoy. Update Pokemon Go++ 1.45 how to hack? Before I start the update, I want to say thank you to everyone of you who showed so much interest in my Pokemon Go Hack updates. If you don’t already know, there are safari events happening on Pokemon Go in Europe. If you don’t live in Europe, unfortunately you can not attend these events. But let’s be realistic here, who would pay thousands of dollars to travel all the way to Europe to attend these events? Don’t get me wrong, I like Pokemon Go but I would rather spoof to get to these events. First of all, download the remove vNY ersion of tutuapp and pokemon go from your iPhone. matDoesn’t ter which version you have installed, just remove it. Now open Safari and visit tutuapp.vip. There you will need to press the Regular tab at the top of the page and then click the green download button. Wait for the popup and when it shows up, press Install and go back to the home screen of your iPhone. After the tutuapp has installed Successfully, open Settings, navigate to general section and select Profile management option. Here you will need to trust the profile of the tutuapp developer. Now go back to the home screen and open up tutuapp. Inside there you will need to search for the Pokemon Go hacked version. Once you found it, press the green download button at the bottom of the page and press install on the popup. The last step is to trust the developer profile of Pokemon Go hack from Settings > General > Profiles management. I feel like it’s been a long time since I last updated you guys. The reason being I had already added all the possible methods to the pokemon go hack for iPhone. 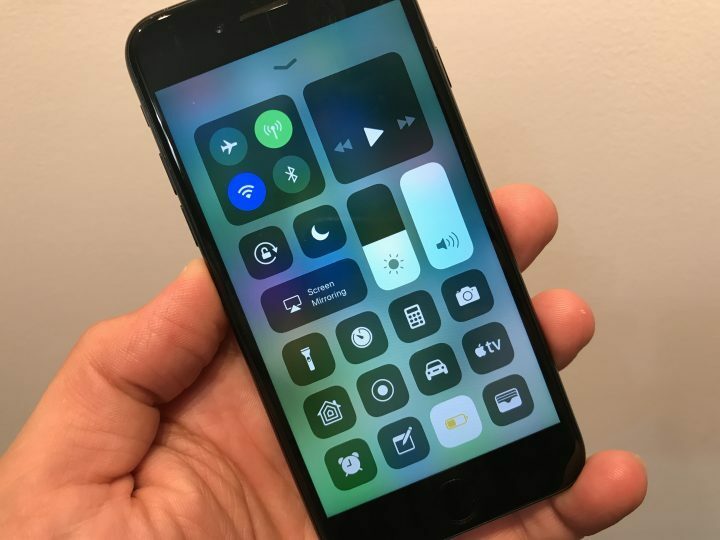 But since the release of iOS 11, there has been quite a lot of issues with the previous methods. Today I will share with you another method to get hacked version of Pokemon Go on any iPhone running iOS 9, 10 or even iOS 11. So, let’s get started. First of all you will need to remove all the previous version of Pokemon Go that you may have installed. Once the page loads up completely, press the search button at the top right corner of the page and search for Pokemon Go Hack. It will show you some results, the one you want to install is the one highlighted below. Just tap ath the logo of the game and it will show you a popup, press install on that popup and go back to the main screen. You should now see Pokemon Go Hack being installed there. Last step in to trust the developer profile, go to Settings > General > Profiles and trust the developer certificate once the app is fully installed. Looks like many of the Pokemon Go Hack users have stopped playing the game. But for those who are still interested in the hack, this is the latest update. First of all, open this link in the Safari browser and wait for a few seconds. You will see an ad which you will need to close. Press the cross button and proceed to the next step. Tap on the Apps tab from the top of the screen and select Hacked games from the next screen. Now look for Pokemon Go from the list and select it. On the next page, you will see a red button which says Install. All you have to do is click the install button and allow the installation from the pop-up that will appear. The last step is to Trust the developer profile from Settings > General > Profiles. I have found a new hacked version of Pokemon Go for iOS 12 that works without jailbreak. So trainers, let’s get right into the installation. First, you will need to delete the older/official version of Pokemon Go from your iPhone. Now open this link on your computer and download the latest version of PokeGo++. The last thing you will need to do is trust the developer certificate from Settings > General > Profiles & Device Management. You can also use our Cydia Impactor tutorial to sideload it on your iPhone. What if you didn’t allow location access? Don’t forget to see my updated trick to dodge soft-ban in Pokemon Go and use teleport without worrying about the ban here. Share it and follow us on twitter if you found this quick tutorial helpful. It doesn’t work anymore for iOS 9 and above maybe even 8 and above because now it wants me to verify the app but it doesn’t work so I go to the main site and it says install (works better with iOS 7) and whenever I try to download it I get a file. Every time I try to go to the website safari can’t find it so how do I get to the website now? The site might have been blocked in your region r DNS. Please try using VPN app. If you are stuck at waiting. Just restart your iPhone and then tap the pokemon go icon which is stuck at waiting. This should jump start the installation. I download the app and it all works fine but i am unable to catch pokemon?? The fastest way to remove your soft ban to spin the pokestop up to 40 times again and again until you het the items. Then you will be able to catch pokemon, fight in gyms etc. I think they might have fixed this hack. As the game has server-side gameplay, there isn’t much we can do about it. I will update the post if I found a working hacked version. Also make sure that you do not use teleport because that results in an immediate soft ban. Try using the official version if that works for your ID. Is this the case with all hacked versions? Also dont use teleport it will cause a ban on your ID. I installed everything and it works fine for my phone, but i tried to install it on my Ipad 2 ( ios 8.3 ) and it goes fine till I need to insert my pokemon trainer club account, it doesn’t let me go through that… what can i do?? I didn’t check it on iOS 8. May be it has some issues on iPads or it may be iOS 8. Can’t say much. i used all my pokeballs now im not having single one so plz help me out this is hack game downloaeded from ur lovely link have try few things to get pokeballs but didnt got any ????? i followed ur link for gogo map too but the problem is wen i opend gogo map i got my current location and during the im not only knowin wer im wat im foing nothing i like ur kinks so plz help me out and some told to go to poke stops wenever i go to poke stop is too far away and no uotput at all so seriously plz help me out ???????? Hi Chandu, Thanks for commenting. Can you please make sure that your ID is ok? Just use it in official game and try to catch pokeballs. Also you have to be near the pokestops to actually spin it and get the pokeballs. hey steve all was working well dude but suddenly a problem upgrade prob arrived plz send link of upgarde pokemon go aur let us know how to do it plz ?? hi.. i also heard they said that this hack have to be renew every 7 days am i ccorrect? No. If you are using “No Jailbreak No Computer” method and it works fine for you then you can continue using it. You will need to renew the hack if you sideloaded it using computer. why the hack bwrsion is jot working and im trying to download it but its shwoing some error while downloading plz help ua out ????? I cant download the hacked version anymore. Does anyone know why? I downloaded everything and when I try to access the app it always backs out. I am really confused and would appreciate if you could help me. That is because the app has been revoked by Game developers. Now you have to use Computer, doesn’t have to be Mac, to sideload the hacked version of Pokemon Go. The app keeps closing when I open it. Why is that? Time. I almost tries it the whole day for now. Can someone give me the solution for this?? Hi, The pokemo go hacked already asking for an update, how can I update this one? Im trying it to update but its downloading normal pokemon go not the hacked one. i installed from iosemus but my character is stuck in the middle of the sea near Nigeria, please help to fix. Yes. Apple have revoked the certificates, that were used to sign the hacked versions. Now you will need to use the computer method. I’ve been try to download it since morning. But when almost finist the text appear and show. “Pokemon go cant be download at this time” i retry back but facing the same problem. Can u help me? Unfortunately there isn’t any “No Jailbreak No Computer” method for Pokemon GO hack. You will need to use this method. You still don’t need jailbreak but a computer is required. Hi, The pokemo go hacked already asking for an update, how can I update this one? The app has been updated and now you can only use your own Apple ID and a Computer to sign the hacked pokemon go and install it via that route. I have made a tutorial on that as well. Without a computer and jailbreak, I am afraid you wouldn’t be able to hack pokemon go as of now. If there is some other method comes out, I will post a tutorial. Untill then you have to wait. Very informative. This method actually worked out ok for me. Thanks Rev Kid! Yes, Many people are reporting permanent bans. Just downloaded the tweak(with jailbreak), no problems at all, chose the 1.3r-80 version. But everytime I open Pokemon Go, it crashes. Do you know why and how I can arrange this ? You will have to install the hacked version using computer. unfortunately all the “No computer” methods have been revoked by Niantic. Here is the step by step guide to ultimate Pokemon Go Hack without jailbreak using computer. i have used the Alternative method #2 the installation was a success, but i am having an issue with the navigation map. I am unable to view any thing like the roads maps, pokestops & pokemons. What may be the problem? Vicky you have been soft banned. That is the reason. Try my updated method. Do you have this for Android? Or any way to work this on Android device? Hi, i manage to download using computer (windows). but i cant use the navigation joystick. and also, i cannot use the “walk here function” kindly help. Have you enabled fake location option from pokemon go hack? Which one works now after the new update from Niantec? Will the Hack with IOSemus work again, soon? You are banned my friend. I would suggest you to install Pokemon Go Hack using this method. When i installed the game it was working fine but somehow i got stuck in a place where there are no pokestops and gyms and it is all blue and green everywhere . Please help me out . Is it necessary to delete the original Pokémon Go App when you install the hacked version with the computer? It would be nice to be able to use the original App, too. Like it was with the Method of IOSemus. Hey! When i enter the Hack version, it crashes.. Please reply..
That is because it has been revoked. Use my updated guide. i have error code lockdown.cpp:75 lockdown password protected after 7 days reinstall. anybody able to help? thanks! Hi! Does this work on a Pokemon Trainer Club Account? Tutuapp and alfa tournament is working but my biggest problem is it keeps on crashing. Those stuck in a place where no pokemon, pokestop ang gym will work after a few hours. i have download the first tutu app. Can use but why cannot collect balls from pokestop when I turn the pokestop? That is soft ban. Here is step by step guide on how to fix that. Tweaked Pokemon go has been revoked by Apple???? But I don’t understand…. Same here on @STARCHILD. Having the same problem as him too. Getting a GPS signal not found on both the hacked version and the regular version. Is this the ban? I used wife’s account on the hacked version; never logged out of mine. Been using the tutu app hacked version without problems for a month or so, but after downloading IOS 10 on my iPhone 6, had to reinstall the the newest version of the hack with the buddy system. It works fine, until closing out and reopening It, The teleport and joystick functions are missing, What’s happening here? Try renaming a pokemon once you log back in and the teleport and joystick will pop back up. As of today the tweaked version 1.7.0 has been patched and is now a regular Pokémon GO game I tried redownloading it on tutuapp. Not working on ios 10 iphone 7. Same problem as Michael Mahan! An email response was sent to you yesterday. I set up the one for iPhone without jailbreak and I can not log in. I get the server error and that they are trying to resolve the problem. I tried to sign in with a new google account and it didn’t work either. Is this a known issue? Because I have checked if the servers are down and it does not say so. Make sure that you have internet working on your iPhone when trusting/verifying. Mine did the same exact thing as levian. When I deleted and tried to reinstall it says cannot download at this time. Any other tips? I had this on my old phone and just upgraded. Now it’s not letting me download it. It’s saying “unable to download right now from app” and I have tutu installed. ios has a new update now 10.0.2, cud be reason why, as i cannot download hack at all now! Steve i have tried to download the tutu helper regular free, but it sends me a message that it can’t be installed. What should i do? What are the other tweaks not related to tutuapp? I am having the very same issue as Levian, & so I did as you said & started over, but now while trying to reinstall the tutu app, it keeps failing & brings up a retry button which I’ve clicked but then it still doesn’t install, should I just wait & try again later? I have already tried restarting my phone again as well! Thanks in advance! hi when i try to download the app a message comes up saying unable to download app- could not be installed at this time. do you know why this happens and is there anything I can do about this? i cant download tutu app, when it shows up on the homescren it starts to instal and then it says ,unable to install, how do i fix it? I tried restarting my phone, changing the date, nothing works, Please help. Perhaps the link is down? As of today, I am finally able to successfully install the tatuapp and the Pokemon GO app. However, after opening a message appears inside the Pokemon app that says, “A new version of Pokemon Go is available. Would you like to update now?” With another alert forcing me to “Update to continue.” Round and round again. Anyone else having this issue? Yes I had the same issue this morning – “A new version of Pokemon Go is available. Would you like to update now?” With another alert forcing me to “Update to continue.” Round and round again. Anyone else having this issue? tutuapp I got from iosem.com when I clicked on it says untrusted enterprise developer.. What I should do so that I could download the 2nd link which is the t pokemon go? Tutu App has been revoked by Apple again as of at least 8pm CST on 9/27, -and so we can’t download again until it’s taken care of again. Why can’t apple just let us have our fun?? The Bunny app ( Docteur Patricia Dessart SPRLU) and your Pokemon Go app will not verify. Was working yesterday now not working. Any Ideas? I cannot load the tutu app..keep having this c”annot be downloaded at this time “. Is there any alternative? It has actually become a tug of war game between Apple and tutuapp developers. Apple keeps revoking the hack certificate while tutuapp keeps finding new certificates. That is why it keeps on stop working again and again. Is it not working for ios as of 8:00EST on 10/7 or is it just me? I can down load tutu app but not pokemon go. Thanks for any input. Recently Pokemon Go++ is not working (since 10 oct). Is there any updated IPA file to make it work? Now you should be able to play hacked pokemon go fine. Hi Steve I installed the latest hack but when I open the game it lands me straight into another country. How to I teleport or walk home without getting ban? As of now i’m not able to use the hacked app anymore. The app is asking me to update Pokemon Go. When I say yes, it goes to the original Pokemon app. Since today (17 oct)Pokemon Go++ is not working . Is there any updated to make it work again?? You guys could stop cheating and go outside and walk around to play the game. OMG, WHAT?! Hi Steve, I’m asked to verify the apps but unable to do so, deleted and tried to download again but failed to install. Any idea what’s going on? There is a new update but I cannot download any hacked poke app. So uh i need help or link or anything to play again. The new update includes the Poke Eggs with different colors. Hi. Which instructions are the latest, the ones at the bottom? I’ve followed those instructions and it’s still not working. Before installing the tutu app, was I supposed to remove my Pokemon app first, then reinstall after? Help! I just wanna say thank you for your help..???? Hi Steve, I can download Tutu Aps but failed to download Pokémon Go Hack 🙁 I have tried several times but always failed. How can I set the hacked version to my current location? I live in Kentucky and it has me in some other state. it is possible to have the official pokemon go and this hack version installed? Is there a new IPA? The old version is no longer working for me. What if i download the tutuapp but i still have pokemon go would it still work?? One of the given methods should update to the lastest version and start working again. Would you please let me know which one should I install as of March 04 2017? Thank you ! Is tutuapp safe to use? I give the app permission to go into the device software, there they will know everything about my phone, like password and appleid isn’t it? I don’t want to get a big bill for calling to Nigeria or a empty bank account. How far can they get into the IOS software and can I choose what they can see and don’t maybe with a anti-virus software? I checked the site at Norton but it’s untested. I want to use the Pokémon go hack. Thank you for your advice. Don’t worry, it is 100% safe. Trusting the developer profile doesn’t give out your accounts and other sensitive data to the developers. the app fails and closes alot, is this normal? anyone experiencing the same? anyone know how to stop it? so with a new game update comes a wall, will you be updating the app on tutu or do you roughly know how long it will be before tutu releases the updated spoof app? When I open the app, it loads the game but then closes before I can do anything. Help? IOSEmus pokemon go hack has been revoked. I checked their website since the app stopped working for me today. Anyone else experiencing this and know of another hack pokemon go that I can use on my IOS without a computer? Hack downloads and runs but doesn’t allow me to catch Pokemon or use poke stops. That is because you have been temporarily banned by Niantic. You can unban yourself using this guide. I downloaded then tried to install appvaley but I am unable to install it. This problem usually occurs if you have Pokemon Go Hacked version by TuTuApp and you don’t have TuTuHelper installed on your iPhone. Don’t remove TuTuHelper and the game should open up. Hello My game is a little bit laggy but nothing That i notice but it keeps crashing i have tutu heller as a “app” i got at My homescreen anyway but it keeps crashing… what more could I do? Solution to this is already mentioned in the article. You will need to unban yourself by opening the pokestop, Spin it and then close it. Repeat 40 times and you will be unbanned. Hi, it will be update for August patch? I will try to find a working August patch soon. I had the app downloaded, I was playing Pokémon go when it stopped working, I deleted the app and tried to download it again, it keeps saying unable to download app at this time. It seems like Niantic/ have revoked all of the certificates, but don’t worry. It will be back soon. Has this been taken offline now, I can’t seen to downloads any anymore. 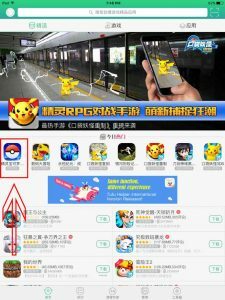 Was the tutuhelper Pokémon go hack revoked? It stopped working today. Or is it going to be back up? Is there another spoofing app like the one on tutu? Yeah, it seems to be revoked. Hopefully it will be back up soon. Did you try other methods? Nothing is working? I have tried the 40 spin method and is not working for me. I have been sitting here for 20 minutes spinning the stop and I’m getting nothing. Is there some wrong or is the ban more than just a soft ban? Make sure you are applying the fix properly. Tap on a poker stop, spin it, go back to the map and then repeat these steps. Hey Steve, I have tried the Forty spin fix, but it’s not working for me. Is there something else I can do or is my app just not going to work like this? That fix should have worked as it is working for many people. I think you will need to wait for a couple of hours so the temporary ban is removed. You can always use the Cydia Impactor method with latest Pokémon Go++ IPA. 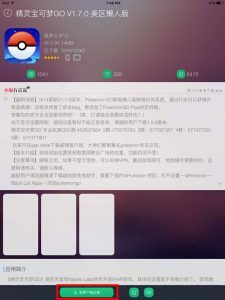 Install the AntiRevoke profile and thek delete the Pokemon Go app. After that Install it again and this should fix the crashing. Try the latest antirevoke method. I have tried for DAYS to go to Tutu’a website and it won’t load. I am on an iPhone. Can you please advise? Thanx in advance! Thanks for this awesome guide. Really helpful. Finally, I found a guide that actually works. I have downloaded the app and it installed but i cant seem to catch pokemon nor can i receive things from the pokestops,how can i fix this? You must have been banned from the game, try to avoid teleporting to remote locations and give this tutorial a try. This tells you how to unban yourself in Pokemon Go. I went to that link but there is no search bar. Tutuapp still hasn’t uploaded their pokemon go app. Hi Steve. Apparently the regular version of Tutuapp doesn’t have a certificate anymore and therefore I cannot open the cracked version of PoGo. It says that the stable VIP version does, but there is no way I’m paying the $12.99/year. Do you have an alternative method? http://ios.sh Does not work either. Worked Perfect. Thanks for this awesome cheat! I can’t seem to download Tutuapp and the Pokémon go hack anymore. Is it on regular software updates or is it due to some preventive measures from Niantic? Try the February update, it is still working. The February update is still working fine. The february update is not working. Can’t open the games. Always crash… somebody help me… please….. If you use the same Pokemon Account on the new hack, you should have all the progress that you made previously. Anyone still can use this hack app to play?? Niantic banned the accs. Any suggestion for iPhone?? So I downloaded the feb 2018 hack, but I’m not having the joystick pop up. I checked the settings, the joystick is listed as “show”. So why isn’t it showing?